Are the Rohirrim masters of horse because Tolkien believed cavalry would have changed the outcome of Viking invasions of England? 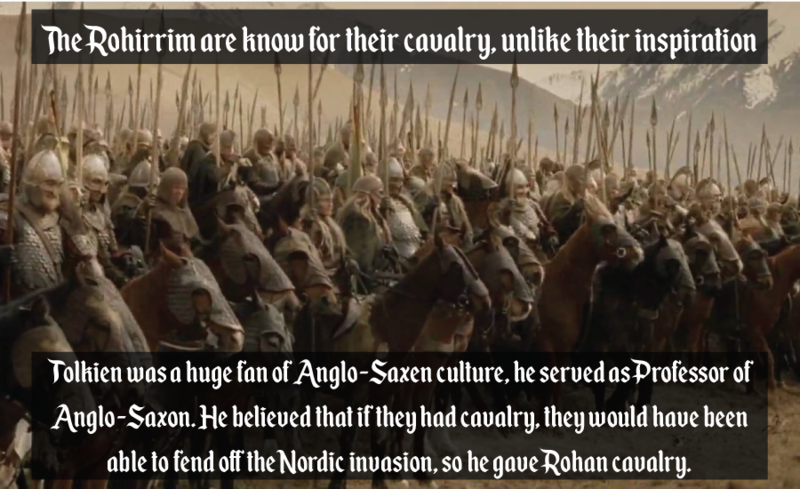 The Rohirrim are know [sic] for their cavalry, unlike their inspiration. Tolkien was a huge fan of Anglo-Saxen [sic] culture, he served as Professor of Anglo-Saxon. 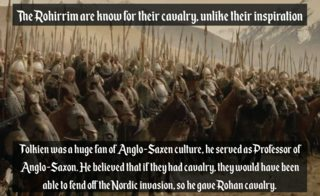 He believed that if they had cavalry, they would have been able to fend off the Nordic invasion, so he gave Rohan cavalry. I am skeptical of this claim. As far as I know, Tolkien never used any such specific influence from Anglo-Saxon history or culture when designing the Rohirrim. He rendered the Rohirric language as Old English just to show that it was a more archaic form of Westron, represented by modern English. I don't have the books to hand, but I also remember the appendices saying the Rohirrim were only Anglo-Saxon in the general sense of being a less developed civilization living under the influence of a greater, more ancient, more advanced civilization (that being Gondor for the Rohirrim, and presumably Rome for the Anglo-Saxons). But the books themselves and the appendices don't suggest the Rohirrim were meant to be direct analogues to the Anglo-Saxons. This doesn't sound like something Tolkien would do, or admit to doing if he had done. Is this claim actually true? Did Tolkien make the Rohirrim masters of cavalry because of some kind of "what-if" situation about the Norse invasions of England? If so, where is it documented? The cavalry of the Rohirrim look like a reimagining of the old Kingdom of Mercia, which was central and western England before Alfred the Great. (I got this idea from one of Tom Shippey's books, either Author of the Century or Road to Middle Earth ... or both. Been a few years since I read them). The old English language that Tolkien used as the model for the language of Rohan is related to the old English from that region. The symbol of the white horse on a green field (on the banner of the Rohirrim) is, per Shippey, founded on a real world place in Uffington, which is on the southwestern marches of Mercia (current Oxfordshire) where it runs into Wessex (which was for a while included in Mercia). In Shippey's The Road to Middle-earth his analysis is that the emblem of the King's banner was inspired by the Uffington White Horse. In LoTR, Tolkien did a great job of providing a world with depth. In Middle Earth, you ran across things of great antiquity ... and there are stories behind them. (Example? The two statues at Argonath; the seat at Amon Hen). In Tolkien's reality (England) there were things of great antiquity (Stonehenge, that White Horse, various standing stones, druidic/faerie rings of trees) all of which had stories behind them -- some real and some imagined. From a story teller's perspective, a banner with a white horse would be the symbol of horse people. Not much of a stretch to render the whole kingdom as the home of great horsemen. There is speculation that Tolkien gave the Rohirrim cavalry as a way of fashioning an imaginary Anglo-Saxon riding culture that could have resisted the Norman Invasion. But I'm not aware if there are any writings of Tolkien that would specifically support this. The names and many details of their culture are in fact based on Germanic-derived cultures, particularly that of the Anglo-Saxons and their Old English language, towards which Tolkien felt a strong affinity. Ultimately Anglo-Saxon England was defeated by the cavalry of the Normans at the Battle of Hastings, and some Tolkien scholars have speculated that the Rohirrim are Tolkien's wishful version of an Anglo-Saxon society that retained a "rider culture", and would have been able to resist such an invasion. Although the Duke of Normandy was a descendant of Vikings, I'm not sure if the Norman Invasion would be typified as part of the Nordic Invasion. Actually, if I follow the history correctly, the Battle of Hastings was something of a family affair with Viking ancestry on both sides. I'm neither a Tolkien scholar, nor a historian and I'm sure there are others here who will have more specific information to offer. If Éowyn did not ride into battle with The Rohirrim would the outcome have been much different? Could The Witch-King of Angmar do that much?